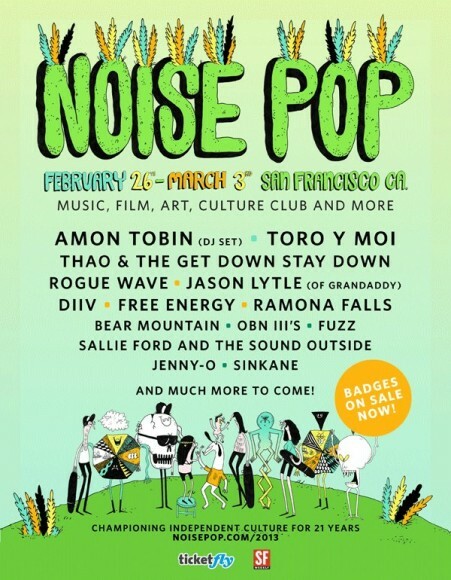 Bay Area music festival Noise Pop, who will be celebrating their 21st anniversary this February, has announced the first wave of the music lineup for the upcoming festivities – which will take from February 26th to March 3rd, 2013. This year’s lineup features Toro Y Moi, Thao & The Get Down Stay Down, Rogue Wave, Free Energy, DIIV, Grandaddy’s Jason Lytle, and a DJ set by Amon Tobin. Take a look at the lineup below and keep an eye out for more confirmations shortly.